Alan Rousseau climbing on the east side of the ridge early on day three. Rousseau and Tino Villanueva had to traverse east to sneak around the very steep sections on the first step above Camp 1. Photo: Tino Villanueva. Crux pitch on day 2: an M6 iced up groove led to steep rock climbing, Villanueva writes. The fluted face they used to access the ridge is below his feet in the shadows. Photo: Alan Rousseau. 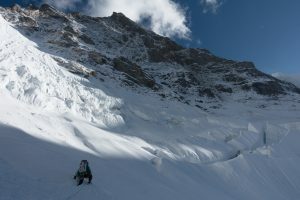 After winning the awards this year, the climbers chose Rungofarka off of a list of peaks that were opened to climbing by the Indian government in 2009. According to Villanueva, the list of peaks are predominantly in Jammu and Kashmir, an area that has been the political and military scene of conflict between Pakistan and India. Villanueva, from Seattle, and Rousseau, from Salt Lake City, have been climbing together for more than 10 years. “We started climbing together in the Cascades and moved on to climbing El Cap, hard classics in Washington and eventually new routes both in the US and abroad,” Villanueva writes. They both work for Mountain Madness, a guide service based in Seattle. After two flights and two days of driving, Villanueva and Rousseau made the trek to Base Camp. Their primary objective was a route up the north face. On September 24, they started up the face. Alan Rousseau nearing their high point on their attempt of the north face. They hoped a bivy ledge would appear near the ice curtain at the top of the photo, but there were no ledges anywhere. Photo: Tino Villanueva. Villanueva and Rousseau have plenty of experience weighing risk in the mountains. In 2012, they went on their first alpine climbing trip abroad, focusing on the Rolwaling Valley of Nepal. During a rappel off a waterfall ice climb, their third partner was hit by rockfall and broke every bone in his right hand. Alan Rousseau punching a trail through thigh deep snow to reach the fluted ramp access point to the north ridge. Photo: Tino Villanueva. So, no strangers to getting back into a rhythm after major setbacks, Villanueva and Rousseau decided to rest for three days after their failed attempt on Rungofarka’s north face. 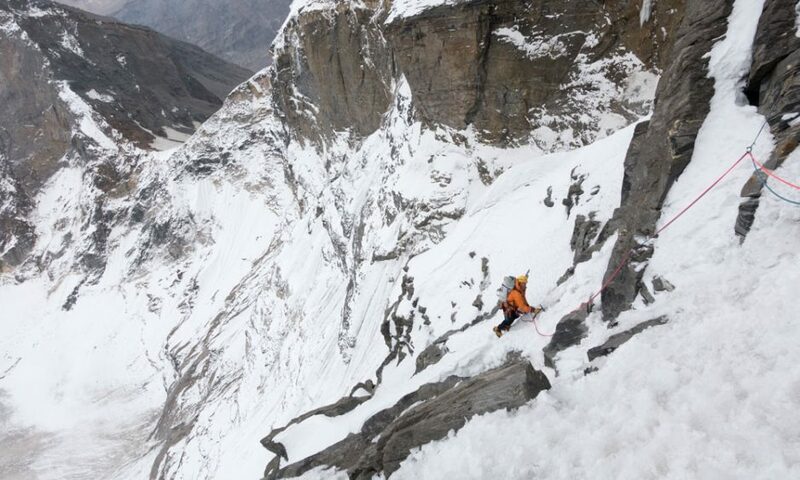 They decided they would try the north ridge instead and trekked up to Advanced Base Camp on September 30. 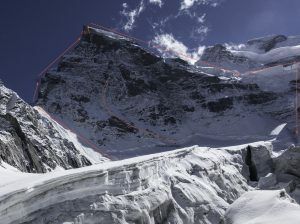 On October 1, the climbers left Base Camp, and climbed mostly in the M5-M6 range with solid belays, runouts and sections of poor gear and loose rock until October 3, which Villanueva describes as a turning point. “Honestly, this day was kind of a blur for me,” he writes. While he recalls a few quality pitches, “There were also some horrific pitches. Rock the quality of dirt, a couple of tension traverses to link rock slabs to climbable features, and finally a six-inch unprotected offwidth crack.” Their biggest piece on the offwidth was a #3 Camalot and it was in the anchor. “Alan worked his way up the crack, placing a couple pitons for protection which I removed with fingertip pressure,”Villanueva writes. After about 20 pitches, they climbed through one more slabby crux before finding a less-than-optimal bivy spot where winds demolished their platform and tent. 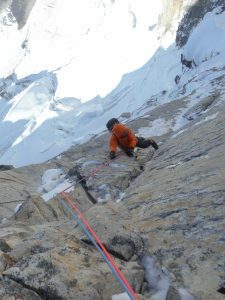 With calm, clear skies the next day, October 4, Villanueva and Rousseau simul-climbed a handful of rope lengths up 60-degree ice to the summit ridge. They reached the summit at noon. Route topo. “Our rappel line through the lower ice cliff is actually slightly out of frame. However, we were deposited very near the bottom arrow point near the blackened ice, where debris from the ice above ran with regularity,” Villanueva writes. Photo: Tino Villanueva. Before receiving the awards to support this expedition, Villanueva and Rousseau also received the Lyman Spitzer (now the Cutting Edge Award) in 2014 from the American Alpine Club, also to climb in the Rolwaling Valley in Nepal. 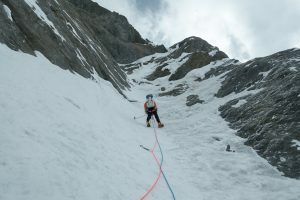 “Warming up” on Pachermo (6,275m), Villanueva and Rousseau established the first ascent of the West Face. “Later, while attempting 6,938m Tengi Ragi Tau, we were forced to turn 300 meters from the top due to a constant stream of debris falling down the face and a lack of safe places to spend the night,” Villanueva recalls. In between climbing together, Villanueva and Rousseau also guide trips around the world. Highlights for Villanueva include guiding 7,000 meters in Kyrgyzstan, 800 meters of rock climbing on Mt. Kenya at 5,000 meters and the remote Mt. Logan in Canada’s Yukon Territory (which Rousseau and Villanueva guided together). According to Villanueva, Rousseau’s highlights would probably include the guided trips he has done in Alaska (Peak 11,300 and the Moose’s Tooth via Ham and Eggs (V 5.9 AI4)), as well as guiding in the Cordillera Blanca mountain range in Peru.